In Drift, Jeff Ferrell shows how dislocation and disorientation can become phenomena in their own right. Examining the history of drifting, he situates contemporary drift within today’s economic, legal, and cultural dynamics. He also highlights a distinctly North American form of drift—that of the train-hopping hobo—by tracing the hobo’s legal and political history and by detailing his own immersion in the world of contemporary train-hoppers. Along the way, Ferrell sheds light on the ephemeral intensity of drifting communities and explores the contested politics of drift: the strategies that legal authorities employ to control drifters in the interest of economic development, the social and spatial dislocations that these strategies ironically exacerbate, and the ways in which drifters create their own slippery forms of resistance. 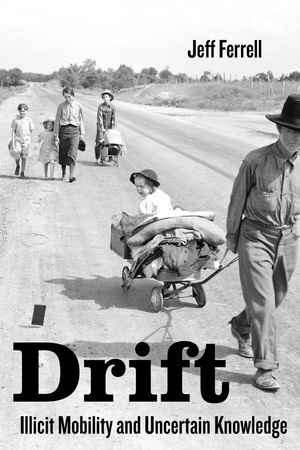 Ferrell concludes that drift constitutes a necessary subject of social inquiry and a way of revitalizing social inquiry itself, offering as it does new models for knowing and engaging with the contemporary world. Jeff Ferrell is Professor of Sociology at Texas Christian University and Visiting Professor of Criminology at the University of Kent. He is the author of Crimes of Style, Tearing Down the Streets, and Empire of Scrounge and the coauthor of Cultural Criminology: An Invitation.